Brand New Genuine set of 5 Peugeot 106 plastic body caps (plug on body). Fits all 106 models. These little black rubber caps are used to fill the holes on certain area's of the chassis, mainly on the floor and underside. They simply pop into place in the hole. Very common for these to go missing! Hole Size is 14mm. Part Description: Brand New Genuine set of 5 Peugeot 106 plastic body caps (plug on body). Fits all 106 models. 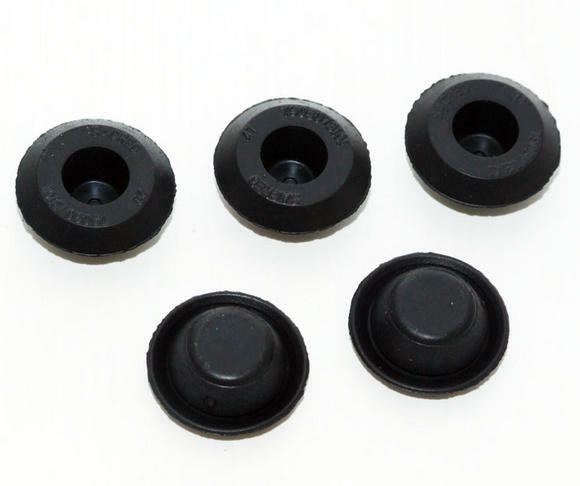 These little black rubber caps are used to fill the holes on certain area's of the chassis, mainly on the floor and underside. They simply pop into place in the hole. Very common for these to go missing! Hole Size is 14mm.